ARRIVAL DAYS - FRIDAYS for 3 or 7 nights, MONDAYS for 4 or 7 nights. 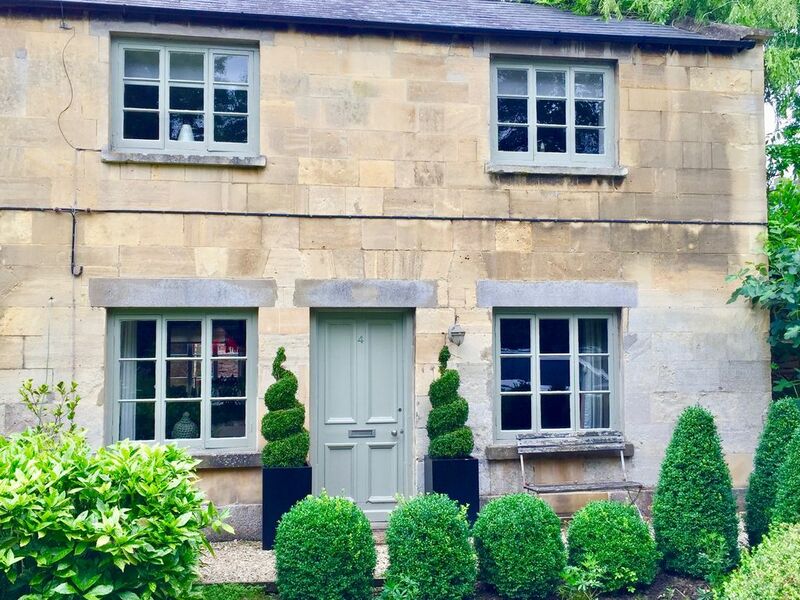 Coates Mill Cottage is stylish 200-year-old Cotswold stone property. It lies in a quiet position in a wooded hollow with a mill stream opposite at the end of a terrace. The property's rural setting belies the fact that it is only a 10-minute walk from the centre of Winchcombe and a 5-minute walk from the nearest pub, The Corner Cupboard. Winchcombe is a small Cotswold town with a wealth of old buildings, and Sudeley Castle. It has a good choice of local shops, pubs and restaurants. For a special occasion, guests may wish to book 'No 5' restaurant, which has a Michelin star. Cheltenham Race Course is a 10-minute drive away. There are excellent walks in all directions from Winchcombe, including The Cotswold Way. Dining room, adjoining kitchen with all mod cons, utility room, cosy sitting room with corner sofa and an open fire ready to light. Stairs to a super-king size bedroom and a King size bedroom. The super-king bed can be converted by prior arrangement into twin beds. Bathroom with bath and shower over. Egyptian cotton linen and towels. Jonathan established his own interior design company in London in 2002. Prior to that he worked at Design Centre Chelsea Harbour. Jonathan moved to Cheltenham in 2006 and along with Jonathan Sellwood created Thirty Two, a boutique hotel with in-house design service. After selling Thirty Two Jonathan & Jonathan opened Barnbury, a design & lifestyle store in Winchcombe. Winchcombe is a very special place, I don't know anybody who hasn't fallen in love with the town. There is so much to see and do - Sudeley Castle, Cheltenham Races, Shopping, Walking, Cycling, and of course eating & drinking. The surrounding countryside is outstanding. Coates Mill Cottage is a home from home, cozy and relaxing. Tucked away down a small lane just 10 minutes walk from the centre of Winchcombe, the setting is peaceful and idyllic. Relax in the large garden in summer or in front of the open log fire in winter. The cotswold way passes in front of the cottage so dog walking is easy. Fantastic quality beds and linen will ensure a great sleep. Everything about it was great! So close to town but very quiet location at the same time. Met Jonathan who is an absolute delight. Wouldn’t hesitate to stay again. Booked 3 nights away with our dogs, loved the cottage and location. Great for lots of different walks all on your doorstep plus Winchcombe has everything we needed and didn’t have to use our car until we left. Really liked the little touches on our arrival. We’ll be back again. Loved the location and the walks were beautiful. The welcome package of essentials for you first night stay could not have been more thoughtful and the information for walks in the surrounding area was ideal for our walks with our dog, if I had to say anything negative it would be that the garden is not secure and as our young dog cannot be entirely trusted not to wander we couldn’t let her off there, we probably should have asked before hand. But overall a lovely stay and break away in very idealic surroundings.